Ash arrives in Johto and sees Suicune. A Snubbull starts to follow Team Rocket. Ash beats Falkner and earns a Zephyr Badge. Ash arrives in Azalea Town and gives the GS Ball to Kurt. Ash beats Bugsy and earns a Hive Badge. 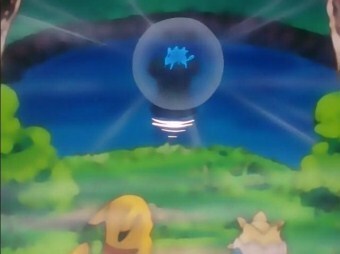 Misty's Poliwag evolves into Poliwhirl. Ash catches a Shiny Noctowl. Ash battles against an Entei who attempts to steal his mum (Movie).